Hong Kong Baptist University is committed to providing a teaching and learning environment that prepares students, faculty and staff to function effectively in today's increasingly interdependent world. Towards this end, the University actively promotes faculty and student exchanges and international conferences/seminars and joint projects with institutions all over the world. Recognizing the importance of "bringing the world to the campus", particularly in a society such as Hong Kong, where there is a large pool of international human resources, HKBU is the first university in Hong Kong which launched, in 2004, the Consul-General-in-Residence Programme. The CGiR aims to foster international cooperation and intercultural understanding in today's interdependent world, as well as to enhance students' knowledge of and interest in world affairs. 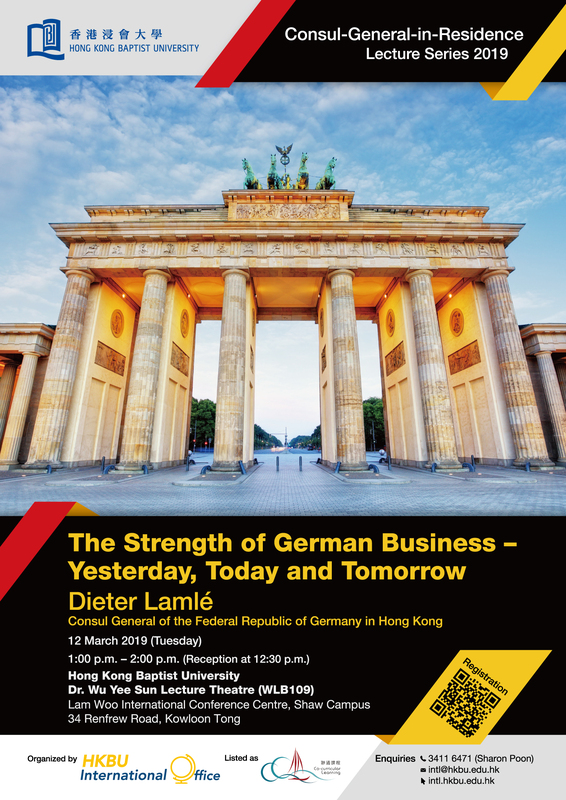 A number of consuls-general in Hong Kong will be invited to join the Programme each year. During their year of residence at HKBU, they will be expected to support and strengthen the international dimension of the work of the University in teaching, research, and service. Specifically, they (or their representatives) will be requested to deliver at least one talk about their countries on topics of their choice. The talks will be part of the University's International Lectures Series, which will be open to the public, and staff, faculty and students of the University. Furthermore, it is hoped that they will be prepared to give advice to the International Office of the University during their year of residence to promote exchanges between Hong Kong and their home countries in general and between HKBU and universities in their home countries in particular. In return for their support, the appointed consuls-general will be accorded the title of "Consul-General-in-Residence" of the University with the privileges of access to all common facilities of HKBU. The HKBU International Office is responsible for the execution of the Programme, under the direction of Dr. Albert Chau, Vice-President (Teaching & Learning), whose portfolio covers the broad areas of teaching and learning as well as the formulation of internationalization strategies.